If you’re at work, you may want to lock yourself in the bathroom, because you’re about to cry tears of joy. 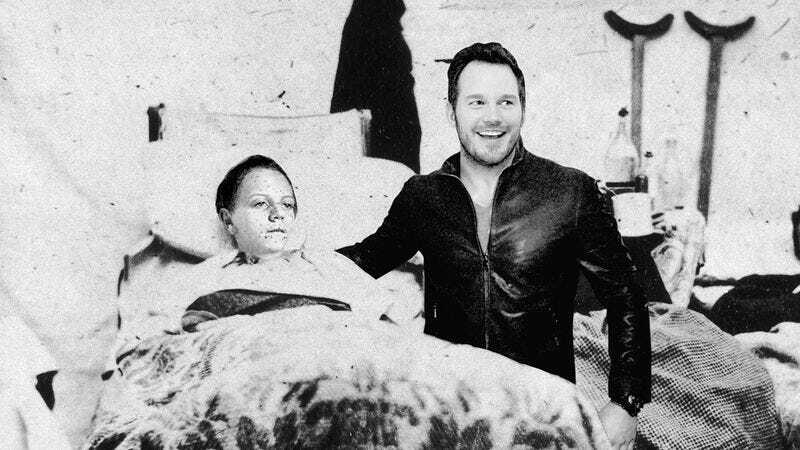 An antique trunk purchased at an estate sale has been revealed to contain something incredible: Civil War-era photos of Chris Pratt taking a moment out of his busy schedule to comfort a boy dying of smallpox. How remarkably kind! Just when you’re about to give up on the human race, this happens. What a lucky little guy! The sepia-toned photos show Chris at the boy’s bedside, bravely risking being infected with the deadly disease to bring joy to the child. Comforting children suffering from smallpox is something you just don’t see many celebrities doing, much less during the time of the American Civil War. Making it all the more impressive, this was no quick photo op, as Chris had to pose completely still next to the highly contagious Daniel for a full 30 minutes while the copper on each daguerreotype plate was fully etched by the mercury fumes. Um, yeah. Chris Pratt is officially the best. He even showed up in costume and officially commissioned young Daniel as a co-captain of the Milano! Wow. Sounds like the whole experience was totally life-changing for little Daniel, even though he did unfortunately succumb to his disease a few days after Chris’ visit 155 years ago. But the amazing Chris Pratt really helped Daniel forget about his 107-degree fever and body being completely covered in fluid-filled bumps for a little while. He’s an even bigger hero in real life than he is in his movies. And that’s pretty amazing. Faith in humanity restored!